D.C. has gone from snow to 60s in the same week with rainy, humid weather since the weekend, with more rain tomorrow and some snow this weekend. Holiday decorations have made the commute fun this week and I took a lot of night photos, but I don’t have a transfer cord with me tonight…so here’s a bike photo from Hains Point around 7 p.m. last week, before our first snowstorm of the winter. 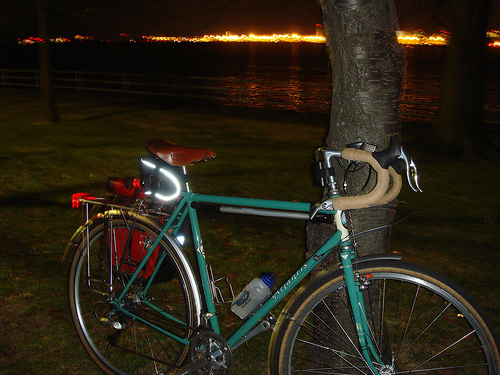 This is my 59 cm Rivendell Atlantis, my main commuting and grocery bike these days. In the summer there’s a regular mix of racers, tourists, and commuters (like me and MG) riding around HP, decompressing from work. In the winter, it’s quiet and we look for the family of foxes that scurry around the golf course. Ah yes, the peaceful life of the witertime commuter. Down here, there’s no commuters in the summer either so I own the roads year round. Except for the cars ofcourse but then they’re just a minor inconvenience anyway.